As the title name states, this is the Rainbow Kitteh collar. 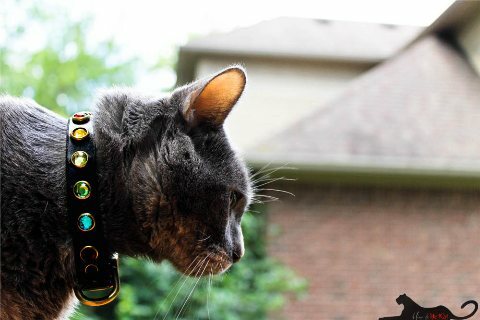 Rainbow goodness in rhinestones deck this collar out to make your kitty the most colorfully decorated cat on the block! The rainbow colors for this collar are: Red, orange, yellow, light green, turquoise, and purple. This collar will be available in 1/2", 5/8", and 3/4" (3/4" tapered to 1/2" at the buckle). It's available in your choice of brass or silver hardware. It is available in black or honey leather. If your cat's neck falls on the end size of one of the collar sizes, choose the next size up. Ex: if your cat's neck is 9", choose the 9"-11" collar size. 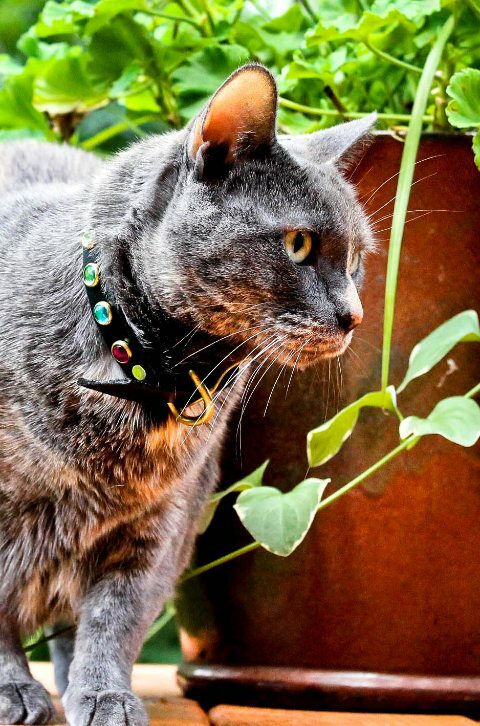 ***All cat collars are made with a safety feature unless you contact us and tell us you do not want one.